The BOSS Power Wah has been around for a long time but they have mostly been based around digital modeling. The BOSS PW-3 instead is a completely analogue circuit with 2 modes of operations so you can get the classic wah sound found on countless records or opt for the fuller sounding 'Rich' mode which has much stronger low end definition. Wah pedals can be the biggest pain in the backside when trying to put it on your pedalboard. BOSS know this so with the PW3 they have made the pedal a lot smaller so that it will now fit on almost any board with ease. They didn't just make it smaller however. They moved the LED's to the side so you can easily see when the pedal is engaged as well as adjusting the motion of the pedal so it still feels natural to use. We all know the classic wah sound that has been used by artists like Zakk Wylde, Kirk Hammet, Jimi Hendrix, Slash and many more. You have access to that sound in this small compact wah pedal but that is not all. 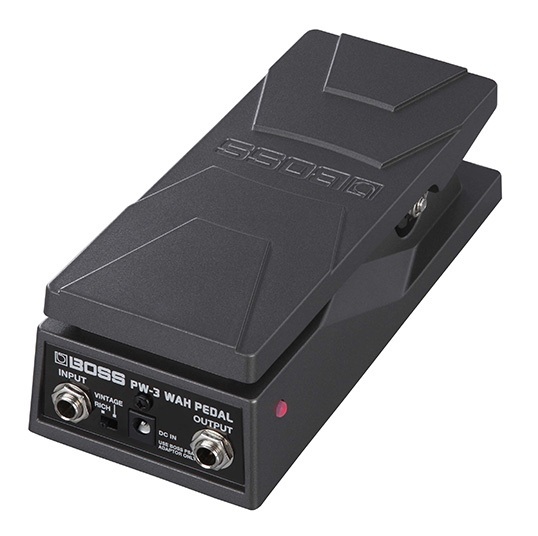 BOSS have also developed what they consider to be a fuller and richer sounding wah sound that was not previously possible with a typical wah circuit. Just flip the switch on the back you go from a vintage wah to a sound that keeps a lot more of your guitars low end in the mix perfect for your next huge solo.